1. To make the rice, pulse the chopped parsnips in a food processor fitted with an S-blade until it resembles rice. You may need to do this in batches, depending on the size of your food processor. Transfer to another bowl and stir in the vinegar, agave and salt. Set aside. 2. To make dipping sauce, combine tamarind, agave, lime juice, coconut water and coconut aminos in a small bowl. Whisk to combine then set aside. 3. 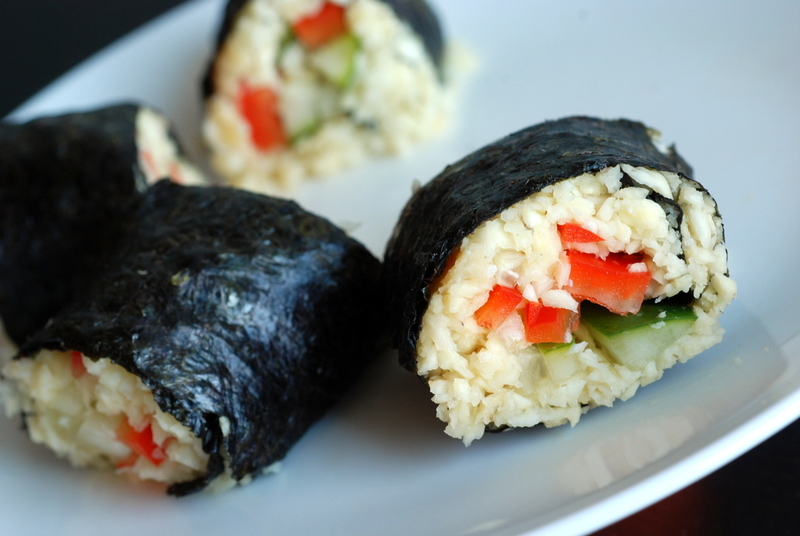 To assemble the rolls, place nori sheet down, shiny side up (I didn’t notice a difference), on top of a mat, and place 3/4 cup parsnip rice on half of the nori sheet, closets to you. Use your ahnds (or spatula) to press the rice down completely, covering the bottom two-thirds of the sheets, edge to edge horizontally. Leave a 1-inch border of nori on the edge furthest away from you. 4. Lightly sprinkle the rice with the togarashi and sesame seeds and then stack a few pieces of each vegetable and a few sprouts (if using) on top of the parsnip rice, leaving them hanging off the side edges for a nicer presentation. 5. Now you can roll. Use your mat to roll the sushi together. (The book has more detailed instructions). Dip your fingers in the warm water, and then run it along the border of the exposed nori and seal the dampened nori to the roll. 6. Remove from the mat and use a sharp nice (not a serrated knife, I tried and failed) to cut into bite-sized pieces. Serve each roll with the tamarind dipping sauce. I love cleansing. I try to do at least a 3 day cleanse every season. I just feel like it keeps me balanced! There are so many ways to ‘detox or cleanse’ but I do LOVE to ‘reset’ my body whenever it needs some loving care – Not just with clean food (vegan/raw/juicing) but detoxing from technology, and situations/people that stress me out. Taking a break from being exposed to ‘depressing’ world events and just getting back into being centered, grounded and grateful for all the wonder things in this world and my life! Love your improved sushi rolling mat. Not sure about a cleanse however. I love raw food – but it is almost impossible for me in the winter! So cold and no local veg! I’d love a great cookbook – and this sushi looks Delish! I think detoxes and cleanses are great short term- we live in such a toxic world that no matter how good we are normally, our liver can end so overburdened! Short term is the key though! Wow, this sounds fascinating! I would never have thought of parsnip as something that would work well raw. And thank you so much for joining the challenge. I think this will be a big raw week for me, since it’s going to be high thirties and early forties (celsius) all week. Wish I lived in the UK, USA or Canada and could join your giveaway, but that’s how things go. You have no idea how refreshing I found your opening of this post. At this time of year, I regularly hold my tongue when reading about detoxes, goals to ‘eat clean’ / ‘lose weight’, and other diet-type topics. (I will be vocal about my preferences if asked but generally hold off leaving comments on others’ remarks.) I can’t stand any of it but appreciate that for some, it’s not easy to let go of those things. But – I’m really, really delighted when I come across people who have the same perspective and don’t hesitate to say it. Thank you 🙂 Like you, I find plant-based food fun, an opportunity for creativity, and good for my health – but it’s not about deprivation. After that little rant, I love the look of this parsnip sushi and will definitely be giving it a go. I’ve tried cauliflower but not parsnip rice! In my early 20’s I decided to make major changes for my health and began with a 7-day water fast. I became vegetarian and quit smoking and drinking, soda pop. For the rest of my 20’s and 30’s I fasted every Monday. I think detoxing in the sense of stepping back and remembering what “taking care”of yourself really means is superhelpful…eating mindfully and exercising moderately and being kind to yourself, and losing or changing anything that’s negative. I’m not a fan of fasts or other extremes for myself but they seem to work wonders for some people so more power to them! I don’t really believe in detoxes either…I feel like as long as I go back to eating mostly vegetables, with sweets in moderation, then everything will even itself out. But that doesn’t mean there isn’t room for some raw meals in my diet! These look great! I think that detoxes sometimes are a good idea. But the amount I have read about how often some people do them I think they are sometimes going overboard and missing out on some good nutrition. I have done them, in part, before. I did a sugar/wheat detox for 2 years and was astonished at the results. I felt better, had less headaches, did not need to wear my glasses as often and lost 10 kilos. I have done sugar detoxes and now have a very, low ‘sugar’ diet, which excludes sucrose altogether. Love your blog and as someone whose diet is wheat, GF, meat, raw, vegan and vegetarian all at once, I love to add some of your recipes to my exploration of food. I strongly believe that our bodies need a little extra support through detoxification. I’ve noticed that when I eliminate processed and acid-forming foods, my body becomes more efficient. My immune system is stronger and I have great energy and vitality. I think it is one of the finest tools we have for our physical, mental, emotional, and spiritual health. I love this recipe.. it seems like a solid recipe on which you could easily build! I also love the tamarind sauce.. I’ve played a bit with tamarind and I do not like it much, I find it overpowering. But I bet if I followed someone else’s recipe it’d be a better balance! 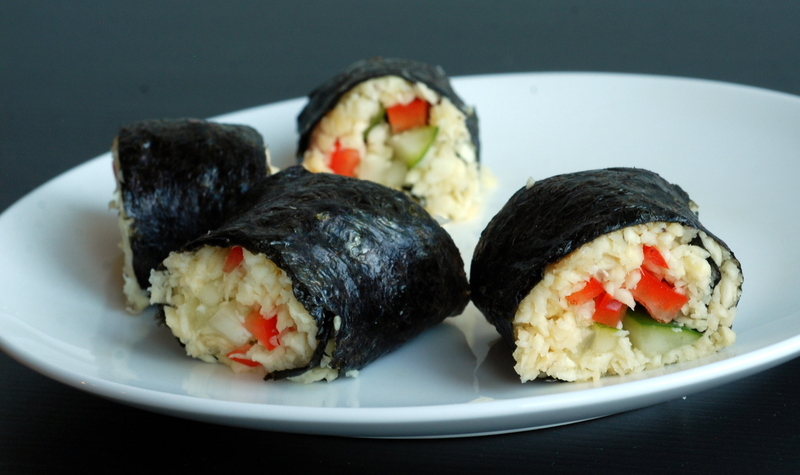 Ooh, I’ve never tried parsnip rice in sushi. I used almond rice before, but this would be far lighter. Thanks for sharing at Raw Foods Thursdays. I’m highlighting this tomorrow!